For the earlier vocal group of Barbara fame, see The Temptations (New York vocal group). For other uses, see Temptation (disambiguation). The Temptations is an American vocal group who released a series of successful singles and albums with Motown Records during the 1960s and 1970s. The group’s work with producer Norman Whitfield, beginning with the Top 10 hit single "Cloud Nine" in October 1968, pioneered psychedelic soul, and was significant in the evolution of R&B and soul music. The band members are known for their choreography, distinct harmonies, and dress style. Having sold tens of millions of albums, the Temptations is among the most successful groups in popular music. Featuring five male vocalists and dancers (save for brief periods with fewer or more members), the group formed in 1960 in Detroit, Michigan under the name The Elgins. The founding members came from two rival Detroit vocal groups: Otis Williams, Elbridge "Al" Bryant, and Melvin Franklin of Otis Williams & the Distants, and Eddie Kendricks and Paul Williams of the Primes. In 1964, Bryant was replaced by David Ruffin, who was the lead vocalist on a number of the group's biggest hits, including "My Girl" (1964), "Ain't Too Proud to Beg" (1966), and "I Wish It Would Rain" (1967). Ruffin was replaced in 1968 by Dennis Edwards, with whom the group continued to record hit records such as "Cloud Nine" (1969) and "Ball of Confusion (That's What the World Is Today)" (1970). The group's lineup has changed frequently since the departures of Kendricks and Paul Williams from the act in 1971. Later members of the group have included singers such as Richard Street, Damon Harris, Ron Tyson, and Ali-Ollie Woodson, with whom the group scored a late-period hit in 1984 with "Treat Her Like a Lady". Over the course of their career, the Temptations released four Billboard Hot 100 number-one singles and fourteen R&B number-one singles. Its music has earned three Grammy Awards. The Temptations was the first Motown recording act to win a Grammy Award - for "Cloud Nine" in 1969 - and in 2013 received the Grammy Lifetime Achievement Award. Six of the Temptations (Edwards, Franklin, Kendricks, Ruffin, Otis Williams and Paul Williams) were inducted into the Rock and Roll Hall of Fame in 1989. Three classic Temptations songs, "My Girl", "Just My Imagination (Running Away with Me)", and "Papa Was a Rollin' Stone", are among The Rock and Roll Hall of Fame's 500 Songs that Shaped Rock and Roll. The Temptations was ranked at number 68 on Rolling Stone magazine's list of the 100 Greatest Artists of all time. As of 2018[update], the Temptations continues to perform with founder Otis Williams in the lineup (Williams owns rights to the Temptations name). Eddie Kendricks and Paul Williams started singing together in church as children. By their teenage years, they formed a doo-wop quartet in 1955 with Kell Osborne and Wiley Waller, naming themselves the Cavaliers. After Waller left the group in 1957, the remaining trio left Birmingham to break into the music business. The group settled in Detroit where they changed their name to the Primes under the direction of Milton Jenkins. The Primes soon became well known around the Detroit area for their meticulous performances. Jenkins later created a sister group, The Primettes, later known as the Supremes. Kendricks was already seen as a "matinee idol" in the Detroit area while Williams was well received for his baritone vocals.Texas teenager Otis Williams moved to Detroit as a youngster to be with his mother. By 1958, Williams was the leader of a vocal group named Otis Williams and the Siberians. The group included Elbridge "Al" Bryant, James "Pee-Wee" Crawford, Vernard Plain and Arthur Walton. The group recorded a song, "Pecos Kid" for a label run by radio deejay Senator Bristol Bryant. Shortly after its release, the group changed its name to The El Domingoes. Following this, Montgomery native Melvin Franklin replaced Arthur Walton as bass vocalist and Detroit-born Richard Street (claimed by Melvin Franklin to be his cousin) replaced Vernard Plain as lead singer. Signing with Johnnie Mae Matthews' Northern Records, the group had their name changed again to The Distants. The group recorded two Northern singles including "Come On" (1959) and "Alright" (1960). Between these releases, Albert "Mooch" Harrell replaced Pee-Wee Crawford. "Come On" became a local hit and the Warwick Records label picked the record up for national distribution. Following the release of "Alright", Matthews appointed Williams the group leader, and the group's name was changed to Otis Williams & The Distants. During this period, both the Primes and Distants were influenced by other vocal groups including the Miracles. Other inspirations included the Cadillacs, Frankie Lymon & the Teenagers, the Drifters, and the Isley Brothers. Though "Come On" was a local hit in the Detroit area, the Distants never saw much record sales and "Alright" was not as successful. After receiving an offer from Berry Gordy to sign with Motown Records, the Distants got out of their contract with Northern Records. However, Mooch Harrell and Richard Street shortly departed from the group and the remaining members lost use of the Distants name. Richard Street later formed another Distants group who recorded for the Thelma label in the early 1960s. A promotional image of the original early 1960s Temptations lineup. Clockwise from top right: Otis Williams, Paul Williams, Melvin Franklin, Eddie Kendricks, and Elbridge "Al" Bryant. Members of the Distants were acquainted with the Primes as both groups participated in the same talent shows and performed at the same public venues. Friendly rivals, the Primes were considered to be the more polished and vocally stronger group of the two. The Primes disbanded in 1960 after Kell Osborne moved to California. Eddie Kendricks and Paul Williams returned to Alabama following the band's dissolution. While visiting relatives in Detroit, Kendricks called Otis Williams, who desperately needed two more members for an audition for Gordy's label and offered Kendricks a lead singer place in his new group. Kendricks agreed on the condition he bring Paul Williams with him. Otis Williams happily agreed and Kendricks and Paul Williams moved back to Detroit to join the new group. The original name for the new lineup of Otis Williams, Melvin Franklin, Elbridge "Al" Bryant, Eddie Kendricks, and Paul Williams was the Elgins. Under that name, the group auditioned for Motown in March 1961. Already impressed with some of the members after hearing session work, Berry Gordy agreed to sign the group to the Motown imprint, Miracle. However, before signing, Gordy discovered another group was using the name of Elgins. The group began tossing about ideas for a new name on the steps of the Hitsville U.S.A. studio. On a suggestion from Miracle Records employee Billy Mitchell, songwriter Mickey Stevenson, and group members Otis Williams and Paul Williams, the Temptations became the group's new moniker. The "Elgins" name re-surfaced at Motown in 1965, when Gordy renamed a quartet called the Downbeats as the Elgins. The Temptations' first two singles, "Oh Mother of Mine" and "Check Yourself", with Paul Williams on lead, were released on Miracle before Gordy closed the label down and reassigned the band to his latest imprint, Gordy Records. On the Gordy imprint, Eddie Kendricks sang lead on the Temptations' first charted single, "(You're My) Dream Come True", which peaked at number 22 on the R&B chart in 1962. Later that year, the Temptations began touring as part of the Motortown Revue. The group would issue eight recordings between 1961-63 without much success. Paul Williams and Eddie Kendricks split the leads during this early period, with Al Bryant, Otis Williams, and Melvin Franklin occasionally singing lead, as they would on a song titled "Isn't She Pretty". For a brief time, the group almost had their name changed to The Pirates, and recorded the songs "Mind Over Matter" and "I'll Love You Till I Die" under that name. Eventually the label and the group decided against it. One hit song, "Do You Love Me", was originally to be recorded by the Temptations. When he couldn't get a hold of the group, Gordy produced a version for the Contours. In 1963, the Temptations began working with Smokey Robinson as producer and writer. Robinson's first work with the group was the Paul Williams-led "I Want a Love I Can See". While the song failed to chart, it did eventually become a popular live performance spot for the group and particularly for Paul Williams in general. Some called the group "The Hitless Temptations" due to their lack of hits. During this time, David Ruffin began following the group around as he aspired to join them. During a local Detroit performance, Ruffin joined the group onstage and impressed the group with his vocal talent and dancing skills. Following that same time, Al Bryant had grown frustrated with the group's lack of success and became restless and uncooperative, preferring the mundane routine of his day job as a milkman over the rigors of rehearsal and performing. After a second altercation onstage at a Christmas performance, having struck Paul with a beer bottle during a heated quarrel at an earlier gig in the middle of the year, Bryant was summarily fired from the group. As a result, David Ruffin was brought in as his replacement in January 1964. Though Ruffin's brother, Jimmy was also considered for the slot, David was selected following his performance with them in 1963. Bryant continued to perform in a number of other local groups, and died at the age of 36 in Flagler County, Florida, of liver cirrhosis on October 26, 1975. The Temptations would now consist of Otis Williams, Melvin Franklin, Paul Williams, Eddie Kendricks, and David Ruffin; the success that would follow the group would result in what would, in later years, be frequently referred to as the "Classic Five" lineup. In January 1964, Smokey Robinson and Miracles bandmate Bobby Rogers co-wrote and produced "The Way You Do the Things You Do" with Eddie Kendricks on lead and the single became the Temptations' first Top 20 hit that April. Shortly afterward, "The Way You Do The Things You Do" and several pre-David Ruffin singles were compiled into the group's first album, Meet the Temptations, released in early 1964. The next two Temptations singles in 1964, "Girl (Why You Wanna Make Me Blue)" along with "I'll Be in Trouble" and its B-side "The Girl's Alright with Me", all featured Kendricks on lead (although Franklin sang one line in "I'll Be in Trouble"). However, producer Smokey Robinson saw potential in the "mellow yet gruff" voice of David Ruffin, and thought that if he could write the perfect song for his lead, then the group could have a Top 10 hit. While traveling as part of Motown's Motortown Revue later that year, Robinson and fellow Miracles member Ronnie White wrote "My Girl", which the Temptations recorded in the fall of 1964 with Ruffin singing his first lead vocal for the group. Released as a single on December 21, 1964, the song became the Temptations' first number-one pop hit in March 1965. Over 50 years and multiple chart topping songs later, it is still their signature song to this day. After the success of "My Girl", Ruffin sang lead on the next three singles: "It's Growing", "Since I Lost My Baby", and "My Baby", which all made it to the Top 20 in 1965. The B-side to "My Baby", "Don’t Look Back", featured a stirring lead from Paul Williams, and was a sleeper hit on the R&B charts and a standard for vocal group playlists. Norman Whitfield had requested the opportunity to write for the group and in 1966, Berry Gordy promised him that if Robinson's "Get Ready", with Eddie Kendricks on lead, failed to chart in the Top 20, Whitfield would be allowed to produce the next song. "Get Ready" subsequently missed its mark, and Gordy issued the Whitfield-produced "Ain't Too Proud to Beg", with David Ruffin on lead, as the next single. "Ain't Too Proud to Beg" outperformed "Get Ready" on the Billboard charts, and Whitfield became the Temptations' new main producer. He began pulling the group away from the ballad-based productions espoused by Robinson, toward a harder-edged and brass-heavy soul sound reminiscent of James Brown. Nearly all singles Whitfield produced prior to 1968 featured David Ruffin on lead, including the R&B number-one/pop Top 10 hits "Beauty Is Only Skin Deep", "(I Know) I'm Losing You" and the early 1967 hit "(Loneliness Made Me Realize) It's You That I Need". Other important singles from this period include "All I Need", produced by Frank Wilson, a Whitfield protégé, and the "You're My Everything", on which Kendricks and Ruffin share lead. Studio albums during the "Classic Five" period apart from Meet the Temptations include The Temptations Sing Smokey (1965), The Temptin' Temptations (1965), Gettin' Ready (1966), The Temptations with a Lot o' Soul (1967), and The Temptations Wish It Would Rain (1968). During this period, the various songwriting partners of Norman Whitfield included Roger Penzabene, Edward Holland, Jr., and Temptations road show manager and guitarist Cornelius Grant. Subsequently, Barrett Strong, who sang the very first hit at Motown in 1959, "Money (That's What I Want)", began working with Whitfield and Penzabene on Temptations material after Eddie Holland left Motown with the rest of the Holland-Dozier-Holland songwriting/production team in 1967. Two of the Whitfield-Strong-Penzabene collaborations, "I Wish It Would Rain" and "I Could Never Love Another (After Loving You)", became hits in early 1968 after the suicide of Roger Penzabene in December 1967. Subsequently, Barrett Strong became the sole collaborator of Norman Whitfield. From early 1964 to mid 1968, the Temptations went from unknown hopefuls to international stars and as a result, appeared frequently on television shows such as American Bandstand, The Ed Sullivan Show, and The Hollywood Palace. At the same time, the group began to achieve a crossover success, catering to middle America with a pop standards album (The Temptations in a Mellow Mood, 1967), the success of which resulted in performances at the famous Copacabana in New York City along with dates at other similar supper clubs. Outside of music, the Temptations were made honorary members of Phi Beta Sigma fraternity. By 1967, David Ruffin had begun demanding special treatment as lead singer, riding to and from gigs in a private mink-lined limousine with his then-girlfriend, Motown singer Tammi Terrell, instead of in the group limousine used by the other four Temptations. The other members slowly became irritated and annoyed with Ruffin's behavior. Following Motown's decision to rechristen the Supremes as Diana Ross & the Supremes, Ruffin felt entitled to the same treatment and demanded that his group be renamed as well, to David Ruffin & the Temptations. Ruffin was also causing friction with Berry Gordy by demanding an accounting of the group's earnings; Motown partially acquiesced by allowing the Temptations to retain an outside accounting firm, but the firm did not have full access to the books from the Temptations' manager, International Talent Management, Inc. - a subsidiary of Motown. Some of this behavior was attributed to the fact that by this time Ruffin had begun using cocaine regularly, building further tension within the group and causing him to miss a number of group meetings, rehearsals, and concerts. There was a consensus among the rest of the group that Ruffin needed to be replaced. When Ruffin missed a June 1968 engagement at a Cleveland supper club in order to attend a show by his new girlfriend, Barbara Gail Martin (daughter of Dean Martin), the group decided that he had crossed the line. The other four Temptations drew up legal documentation, officially firing Ruffin on June 27, 1968. The next day, Dennis Edwards, a singer formerly of the Contours that Eddie Kendricks and Otis Williams already had pegged as a potential Ruffin replacement, was hired to take Ruffin's place. Edwards and Ruffin were good friends, and at first, Ruffin went along with the changing of the guard and encouraged Edwards. However, at Edwards' official debut with the Temptations in Valley Forge, Pennsylvania, on July 7, Ruffin came to the show and jumped onstage, taking the microphone from Edwards, singing lead on "Ain't Too Proud to Beg," and disappearing as quickly as he had appeared. Ruffin repeated this stunt several times throughout the group's July tour run. Despite the group hiring extra security to keep Ruffin out, he continued to find ways to sneak into the venue and jump onstage when the group performed one of the songs he had once sung lead on. In a story recounted several times by Dennis Edwards, (rebutted by Otis Williams and Temptations road manager Don Foster), after several of these stunts, the positive audience reactions and a remorseful Ruffin's pleas to be let back into the act convinced the other Temptations to do so. Otis Williams informed the then still-new Edwards that the group would lay him off and rehire Ruffin while in Gaithersburg, Maryland. However, when Ruffin failed to show up on time the next night for his "return" engagement, the group kept Edwards on and ceased to entertain the prospect of rehiring Ruffin. After Gaithersburg, Ruffin stopped attempting to disrupt the Temptations' concerts and instead turned his attention to the Motown offices back in Detroit. He sued Motown in October 1968, seeking a release from the label, but Motown countersued to keep the singer from leaving and the case was eventually settled out of court. The settlement required Ruffin to remain with Motown as a solo artist to finish out his contract. Edwards' first album with the Temptations was Live at the Copa, recorded at the group's return to the Copacabana nightclub. The year 1968 also saw the debut of the first of a number of collaborations for the Temptations with Diana Ross & the Supremes. The results included two studio albums: 1968's Diana Ross & the Supremes Join The Temptations, which featured Edwards's first studio recordings with the group and the number-two hit single "I'm Gonna Make You Love Me" and "Together". There was also a joint tour and two NBC television specials, TCB (aired December 9, 1968) and G.I.T. on Broadway (aired November 12, 1969). The Temptations perform on The Ed Sullivan Show in September 1969. Left to right: Otis Williams, Melvin Franklin, Eddie Kendricks, Paul Williams, and Dennis Edwards. The addition of Dennis Edwards to the Temptations coincided with the adoption of a new sound for the group by producer Norman Whitfield, and in the fall of 1968, Whitfield began producing psychedelic-based material for the Temptations, derived primarily from the sound of funk band Sly & the Family Stone. This new style, which debuted with the Top 10 hit single "Cloud Nine" in October 1968, was a marked departure from the David Ruffin-era ballads. The instrumentation was funkier, the beat was hard-driving, and all five Temptations traded lead vocals, similar to Sly & the Family Stone. "Cloud Nine", the centerpiece of the group's landmark Cloud Nine LP, was a Top 10 hit and won Motown its first Grammy Award, for Best R&B Vocal Group Performance of 1969. The blending of the Motown sound and psychedelic rock sound resulted in a new subgenre of music called psychedelic soul, also evident in the work of Diana Ross and the Supremes ("Reflections", "Love Child"), Marvin Gaye's version of "I Heard It Through the Grapevine", and music of the 5th Dimension, the Undisputed Truth, and the Friends of Distinction. More Temptations psychedelic soul singles followed in 1969 and 1970—among them "Runaway Child, Running Wild" (a number-one R&B hit), "I Can't Get Next to You" (a number-one pop hit), "Psychedelic Shack", and "Ball of Confusion (That's What the World Is Today)", but the formula began to wear thin when "Ungena Za Ulimwengu (Unite the World)", only went to number 33 Pop in the fall of 1970. The group's other important albums from this period included Puzzle People (1969) and Psychedelic Shack (1970). Psychedelic Shack includes the original version of "War", later made famous by Edwin Starr. Paul Williams, who suffered from sickle-cell disease, fell into depression because of the stress of touring and personal issues. By the late 1960s, he had developed a serious case of alcoholism. Having never previously consumed anything stronger than milk, he began to drink quite heavily, and it was hard to take, according to Otis Williams. As his physical and mental health began to decline sharply, it made performing increasingly difficult. Williams began traveling with oxygen tanks, and the other four Temptations made valiant efforts to raid and drain his alcohol stashes. In late 1969, Richard Street, lead singer of Motown act the Monitors and a former Distant, was hired by Otis Williams to tour with the group as a backup replacement for Williams. For most shows, save for his solo numbers, Williams would dance and lip-sync on stage to parts sung live by Street into an offstage mic behind a curtain. At other shows, and during most of the second half of 1970, Street substituted for Williams on stage when he was too sick to go on. Eddie Kendricks became detached from the group after David Ruffin's firing and as the health of Paul Williams continued to fail. He regularly picked fights with Otis Williams and Melvin Franklin, which often became violent, and in addition, he preferred the ballad material from the earlier days and was uncomfortable with the psychedelic soul material the group was now performing. Kendricks rekindled his friendship with Ruffin, who persuaded him to go solo. He no longer felt he had a say in Otis Williams's handling of the group and was also convinced Motown's handling of the Temptations' finances was cheating the group out of money. Kendricks, being the only member to continue an alliance with Ruffin, also repeatedly suggested that Ruffin should be allowed back into the group, despite the other members' strong objections. Kendricks lobbied strongly in 1970 to have the Temptations go on "strike" - no performances, no recordings - until Berry Gordy and the Motown staff would be willing to go over all group finances with independent accountants. Otis Williams and Franklin strongly opposed this idea, and regular group infighting between Kendricks, Otis Williams, and Franklin grew from this disagreement. After a November 1970 Copacabana engagement, one final confrontation between the three caused Kendricks to walk out in-between shows and not return. Both Kendricks and Williams then agreed that Kendricks would be leaving the group. Kendricks later stated that he actually considered leaving as early as 1965, but remained with the Temptations and unsuccessfully attempted to get permission to record a solo album without leaving the group. Before Kendricks officially left the Temptations, he and Paul Williams recorded the lead vocals for "Just My Imagination (Running Away with Me)", a ballad that became Kendricks' final single with the group. Included on the Sky's the Limit LP along with the original album version of "Smiling Faces Sometimes", "Just My Imagination" was released as a single in January 1971, and the song began steadily climbing the US pop singles chart, peaking at number 1 two months later. By the time "Just My Imagination" topped the charts, Kendricks had negotiated his release from the group and signed a solo deal with Motown's Tamla label. 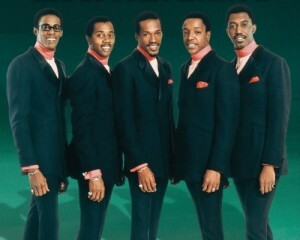 The Temptations originally hired Ricky Owens, from the Los Angeles-based vocal group the Vibrations, to replace Kendricks. However, Owens only played two dates with the group before he was fired for forgetting the words to his solo numbers due to nervousness. For several weeks of the spring of 1971, the Temptations were without a fifth member. Owens meanwhile returned to the Vibrations and died in Los Angeles, California on December 6, 1996, at the age of 57. Whitfield took the remaining Temptations quartet and re-recorded "It's Summer", the B-side to "Ball of Confusion (That's What the World Is Today)", as a replacement single. "Smiling Faces Sometimes" was released as a single for the Undisputed Truth instead, becoming a Top 5 hit on the Billboard Hot 100 in 1971. Meanwhile, "It's Summer" peaked at number 51 on the Billboard Hot 100, making it the first Temptations single to miss the Top 40 since "Farewell My Love" eight years earlier. After his doctor declared a few weeks later that he was unable to continue performing due to medical reasons, Paul Williams quit the Temptations in May. Richard Street officially took Williams' place, although Williams continued to be paid his customary one-fifth of group revenue (Street was paid on salary for the first eighteen months of his tenure), and worked when he could with the group as an adviser and choreographer. After Williams had recovered enough to record again, he recorded two sides in 1973 for a debut solo single. However, on August 17, 1973, Williams died in Detroit at the age of 34 from a gunshot wound, his death ruled a suicide by the Wayne County coroner. In May 1971, the Temptations finally found a permanent replacement for the first tenor position in twenty-year-old Baltimore native Damon Harris. Otis Williams, Edwards, Franklin, Street, and Harris continued recording and performing, and Norman Whitfield continued producing hits for them. There were Top 40 hits such as "Superstar (Remember How You Got Where You Are)" (1971), a message from the Temptations to David Ruffin and Eddie Kendricks, and "Take a Look Around" (1972). During this period, the group toured with Quiet Elegance as their back-up singers. Quiet Elegance featured Lois Reeves, the sister of Martha Reeves, alongside Frankie Gearing and Millie Vaney-Scott. Late 1972 saw the release of "Papa Was a Rollin' Stone", a magnum opus written by Norman Whitfield and Barrett Strong and produced by Whitfield. Originally a three-minute record written and produced for the Undisputed Truth, Whitfield took the somber tune and created a sprawling, dramatic twelve-minute version for the Temptations—a forerunner of the extended single, soon to become popular in clubs and discothèques. An edited seven-minute version was released as a single and became one of the longest hit singles in music history: it hit number 1 on the pop charts and number 5 on the R&B charts. In 1973, "Papa Was a Rollin' Stone" won the Temptations their second Grammy for Best R&B Performance by a Group. Whitfield and arranger/conductor Paul Riser won the award for Best R&B Instrumental Performance for the instrumental version on the B-side, and Whitfield and Barrett Strong won the songwriting Grammy for Best R&B Song. After "Papa Was a Rollin' Stone", Whitfield stopped working with Barrett Strong, and began writing the Temptations' material on his own. The success of "Papa" led Whitfield to create more elongated, operatic pieces, including the Top 10 hit "Masterpiece" (1973) and several of the tracks on the resulting Masterpiece album. Tensions developed between Whitfield and the group, who found Whitfield arrogant and difficult to work with, and the group citing his habitual tardiness, his emphasis of the instrumental tracks at the expense of their vocals on many of his productions, and the declining singles and albums sales as other sources of conflict, sought to change producers. Otis Williams complained about Whitfield's actions and the Temptations' stagnant sales to Berry Gordy; as a result, the group was reassigned to Jeffrey Bowen, co-producer of the 1967 In a Mellow Mood album. The final Norman Whitfield-produced Temptations album, 1990, was released in December 1973, and included the Top 30 single "Let Your Hair Down". Shortly afterwards, Whitfield left Motown, and in 1975 established Whitfield Records, taking the Undisputed Truth and Willie Hutch with him, along with Rose Royce---who performed an instrumental track for "Let Your Hair Down" before recording their 1976 smash "Car Wash."
Bowen's first LP with the Temptations was January 1975's A Song for You, which included a cover of the titular Leon Russell tune (popularized with soul audiences by Donny Hathaway), along with the pop Top 40/R&B number-one hits "Happy People" (featuring the Commodores as the instrumentalists) and "Shakey Ground" (featuring instrumentation by Parliament-Funkadelic's Eddie Hazel along with Billy Bass Nelson). "Glasshouse", the group's final Top 40 Pop hit was also included. Damon Harris was fired from the group during the recording of A Song for You, as his behavior and work ethic were deemed unprofessional, and his replacement was Washington, D.C. native Glenn Leonard, formerly of the Unifics. A number of producers, including Bowen, Brian Holland, James Anthony Carmichael, and even the Temptations themselves tried producing hits for the next three LPs, House Party (November 1975), Wings of Love (March 1976), and The Temptations Do the Temptations (August 1976). None of these recordings were as commercially successful as A Song for You however, and none of their associated singles entered the Billboard charts. As time progressed, Bowen pushed Dennis Edwards further to the front of the group. This was evident on Wings of Love, where several tracks featured Edwards' vocal more prominently than the other Temptations' backing vocals. Otis Williams felt that this was hurting the group, accused Motown of inattention, and cited this as the reason for the group's declining sales and popularity. After The Temptations Do the Temptations was recorded in 1976, Edwards was fired from the group, and with new lead Louis Price on board, they left Motown for Atlantic Records. Success continued to elude the group at Atlantic, however. Their two releases on Atlantic – Hear to Tempt You (1977), and Bare Back (1978), along with their associated singles, had failed to perform any better at Atlantic than their last handful of singles had at Motown. As a result, in 1979, Atlantic released the group from its contract, and shortly afterwards, the Temptations met once again with Smokey Robinson and Berry Gordy, who re-signed the group to Motown in 1980. Upon the return to Motown several lineup changes occurred. Louis Price departed from the group and joined the Drifters. Dennis Edwards—who had made an unsuccessful attempt at developing a solo career during his three-year exit from the group—returned to the lineup. Berry Gordy co-wrote and produced "Power", the Temptations' first single under the new contract. "Power", from the album of the same name, hit number 11 on the R&B charts but failed to chart in the Top 40. Two years of under-performing singles and albums followed, including an eponymous album] with Philadelphia-based producer Thom Bell, until Motown began planning a Temptations reunion tour in 1982. Eddie Kendricks and David Ruffin agreed to rejoin the group for the new album, aptly titled Reunion, and its subsequent promotional tour. Rick James, the Motown funk star who had previously used the Temptations as backup vocalists on his 1981 hit "Super Freak" and whom Franklin claimed as his nephew, wrote, produced, and guested on the Reunion album's lead single, "Standing on the Top". The single went to number-six on the R&B charts and featured Ruffin, Kendricks and Edwards trading back and forth on lead. While the ensuing Reunion tour with all seven Temptations (Ruffin, Kendricks, Otis Williams, Franklin, Edwards, Richard Street, and Glenn Leonard) was financially successful, it ended up being a stressful venture: Kendricks' voice had weakened after decades of chain smoking, Ruffin (still addicted to drugs) missed a number of the performances due to being incapacitated, and current group members Dennis Edwards and Glenn Leonard were causing problems. At the conclusion of the Reunion tour, Ruffin and Kendricks were dismissed, and they began touring and performing together as a duo. One more album, Surface Thrills, released in 1983, featured a sharp departure in the group's sound by incorporating elements of then-current rock. Following its release, Glenn Leonard was let go and replaced by Ron Tyson, who was with the Philadelphia groups the Ethics and Love Committee. Tyson had been a staff songwriter at Atlantic during the Temptations' tenure at that label, and co-wrote several songs on the album Hear to Tempt You. By this time, the Temptations' releases were no longer performing well on the pop charts, though some singles still made the R&B Top 20. "Love on My Mind Tonight," a single from Surface Thrills, charted at number 17. The lineup of Franklin, Williams, Street, Tyson, and Edwards proved to be short-lived. The five performed on Motown 25 and released the direct to video The Temptations: Live in Concert (filmed at Harrah's Atlantic City). The album Back to Basics, released later in 1983, was the first album featuring Ron Tyson on lead. "Sail Away," produced by a returning Norman Whitfield and featuring Ron Tyson's first lead vocal, peaked at number 13 on the US R&B chart. In addition, a then-relatively unknown singer/musician, Ali-Ollie Woodson was featured on one track, "Stop the World Right Here (I Wanna Get Off)." Woodson was a Detroit native who had been a potential candidate to replace Dennis Edwards back in 1977. Meanwhile, Edwards (who also had his share of lead vocals on the Back to Basics album) was again fired in 1984, for missing rehearsals or showing up hungover. He then attempted a second solo career, scoring a hit with the 1984 single "Don't Look Any Further", a duet with Siedah Garrett. At this point, Woodson officially joined the group, taking Edwards' place. Woodson's first lead on a single was 1984's "Treat Her Like a Lady", co-written by himself and Otis Williams, and co-produced by former Earth, Wind & Fire members Al McKay and Ralph Johnson. The single became their biggest success on R&B radio since 1975, reaching number-two on the R&B charts, and just missing the Pop Top 40 at number 48. The group enjoyed further successes with 1985's "Do You Really Love Your Baby," a number 14 R&B hit co-written by soul star Luther Vandross, and 1986's "Lady Soul," the group's third and final Top 10 R&B hit of the decade. Edwards was fired from the group for the third and final time in late 1988, with Woodson re-joining the lineup. On January 18, 1989, the Temptations were inducted into the Rock and Roll Hall of Fame. The event honored Edwards, Franklin, Otis Williams, David Ruffin, Eddie Kendricks (now performing as "Eddie Kendrick"), and, posthumously, Paul Williams. Most of the Temptations, present and former, showed no ill feelings towards one another, although Otis Williams reported that Kendricks would not speak to him during the ceremony. The Temptations ended their induction ceremony with a performance of Paul Williams' signature song, Don't Look Back, dedicated to his memory. After reuniting at the induction ceremony, and much to the chagrin of Otis Williams and Motown, Edwards, Ruffin, and Kendrick made plans to tour and record as Ruffin, Kendricks and Edwards, Former Leads of The Temptations. The tour was in fact carried out, but production on the album was canceled when 50-year-old David Ruffin died in Philadelphia after a cocaine overdose on June 1, 1991. Kendricks was diagnosed with lung cancer soon after; he continued to perform until his death on October 5, 1992, in his native Birmingham. Richard Street missed a performance in 1992 after undergoing emergency surgery to remove kidneystones. Otis Williams, completely unaware of Street's surgery, called him angrily about his absence. Street felt Williams was unsympathetic, and as a result, he left the group in 1993 after twenty-two years. His replacement was St. Louis native Theo Peoples. By the early 1990s, bass Melvin Franklin began missing performances due to failing health and Ray Davis, former bass man of Parliament-Funkadelic, began touring as a fill-in during 1993. Franklin died after suffering a brain seizure at the age of 52 on February 23, 1995, and Davis was named his official replacement. The group subsequently finished production on For Lovers Only, an album of pop standards featuring two tracks recorded with Melvin Franklin prior to his death. This lineup would not last, however, as Davis was diagnosed with lung cancer and left shortly after completing the album. Davis died in New Brunswick, New Jersey of respiratory problems and complications of lung cancer on the evening of Tuesday July 5, 2005. The group continued as a quartet for a short time before recruiting bass Harry McGilberry, a former member of the Futures. For Lovers Only would also be the last contribution for lead Ali-Ollie Woodson; he was released from the group shortly after McGilberry's hiring due to health problems: he suffered two bouts of throat cancer in a short time. He was replaced by new member Terry Weeks, who had served as his sub. The Temptations' new lineup, consisting of Otis Williams, Ron Tyson, Theo Peoples, and newcomers Harry McGilberry and Terry Weeks, toured throughout 1997, and was featured in the halftime show of Super Bowl XXXII in early 1998, which celebrated the 40th anniversary of Motown. Later that year, the Temptations released Phoenix Rising, vocally arranged by 1980s producer Narada Michael Walden, Isaias Gamboa, Claytoven Richardson, Theo Peoples, Tony Lindsey and Skyler Jett, which became their first million-selling album in more than 20 years. The album was anchored by "Stay," a single featuring Theo Peoples on lead and including a sample from "My Girl," which became a number-one hit on the urban adult contemporary charts. Peoples was fired from the group before the release of Phoenix Rising because of issues with drug addiction, and was replaced by Barrington "Bo" Henderson. Henderson lip-synched to Peoples's vocals in the "Stay" music video, and the completed album features lead vocals on different tracks by both Henderson and Peoples. Peoples would go on to join the Four Tops the following year. Also in 1998, de Passe Entertainment (run by former Motown vice-president Suzanne de Passe) and Hallmark Entertainment produced The Temptations, a four-hour television miniseries based on Otis Williams' Temptations autobiography. The miniseries was broadcast in two parts on NBC on November 1 and November 2, 1998, with the first part covering the group's history from 1958 to 1968, and the second part the years from 1968 to 1995. The miniseries was a ratings success and was nominated for five Emmy Awards, with Allan Arkush winning for Best Direction; it was subsequently rerun on the VH-1 cable television network and released to VHS and DVD. Otis Williams' former wife Josephine Miles, Melvin Franklin's mother Rose Franklin, David Ruffin's family, and Johnnie Mae Matthews filed lawsuits against Williams, Motown, de Passe and de Passe Entertainment, Hallmark, and NBC for a number of charges, including defamation. The lawsuits were consolidated, and the judges ruled in favor of the defendants, and the ruling was upheld when the plaintiffs appealed in 2001. Williams later claimed that, although his book was used as the source material for the film, he did not have a great deal of control over how the material was presented. The Temptations were inducted into the Vocal Group Hall of Fame in 1999. In 2001, their 2000 album Ear-Resistible won the group its third Grammy, this one for Best Traditional R&B Vocal Performance. Bo Henderson was fired from the group in 2003, prompting a wrongful termination lawsuit. His replacement was former Spinners lead G. C. Cameron. The lineup of Cameron, Otis Williams, Ron Tyson, Harry McGilberry, and Terry Weeks recorded for a short time before McGilberry was dismissed; his replacement was former Spaniels bass Joe Herndon. McGilberry died on April 3, 2006, at the age of 56. The group's final Motown album, Legacy, was released in 2004. Later that year, the Temptations asked to be released from their Motown contract, and moved to another Universal label, New Door Records. Their sole album with this lineup, Reflections, was released on January 31, 2006, and contains covers of several popular Motown songs, including Diana Ross & the Supremes' "Reflections", the Miracles' "Ooo Baby Baby", Marvin Gaye and Tammi Terrell's "Ain't Nothing Like the Real Thing", and the Jackson 5's "I'll Be There." G.C. Cameron left the group in June 2007 to focus on his solo career. He was replaced by new member Bruce Williamson. The new lineup recorded another album of soul covers, Back to Front, released in October 2007. Former member Ali-Ollie Woodson died on May 30, 2010, after a long battle with leukemia. On May 4, 2010, the group released their Still Here album. The first single from Still Here, "First Kiss", was criticized for having instances of using Auto-Tune technology. The Temptations received the Grammy Lifetime Achievement Award on February 9, 2013. Otis Williams, Dennis Edwards, and the children of David Ruffin, Eddie Kendricks, Paul Williams, and Melvin Franklin attended the ceremony to accept the six Grammys given to the group for the occasion. Former member Damon Harris died on February 18, 2013, from prostate cancer at a Baltimore hospital. Nine days later, former member Richard Street died of pulmonary embolism in Las Vegas, Nevada. At the time of his death, Street was in the process of writing a book regarding his time with the Temptations entitled Ball of Confusion: My Life as a Temptin' Temptation. Completed by his co-author, Gary Flanigan, the book was published in 2014; it is the second autobiography regarding the group. Following their first Motown hit, the group would alter their style several times over the ensuing years, adapting to the popular styles of the day while retaining their signature visual and vocal styles. The earliest Temptations recordings backed by Motown's stalwart studio band, the Funk Brothers, reflect the influence of producers Berry Gordy and Smokey Robinson, and featured a cohesive blend of black rhythm and blues along with elements of white pop music that later came to be known as the Motown Sound. Recordings made prior to 1966, such as "My Girl", were built around songs with simple, direct lyrics supported by an R&B rhythm section with orchestral strings and horns added for pop appeal. During this period, each recording usually featured only one lead singer, usually David Ruffin or Eddie Kendricks, although Paul Williams, Melvin Franklin, and Otis Williams each had solo numbers of their own at various times during this period. In 1966, Norman Whitfield changed the group's dynamic, moving them away from the previous one lead singer model and adding elements derived from the rougher soul of artists such as James Brown, Wilson Pickett, and the performers at Stax Records. Whitfield and his lyricists crafted Temptations songs with shifts of dynamics, syncopated horn stabs, and more intricate harmony arrangements which spotlighted each singer's unique vocal range. Onstage, this change was reflected in the group's use of a custom-made four-headed microphone stand, invented by David Ruffin. When Ruffin was replaced by Dennis Edwards, and Sly and the Family Stone became popular, Whitfield again restructured the Temptations' sound, this time driving the group almost completely into a "psychedelic soul"-type sound. However, ballads in the traditional style of the group were still being recorded as B-sides and album fillers, with the lone exception being "Just My Imagination". Tracks such as the album version of "Run Away Child, Running Wild" from Cloud Nine, "Take a Stroll Thru Your Mind" from Psychedelic Shack, and "Smiling Faces Sometimes" from Sky's the Limit, all run at least eight minutes. At Whitfield's insistence, a large portion of the additional running time for each song consisted of instrumental passages without vocals. For example, the hit version of their smash 1972 single "Papa Was a Rollin' Stone" was nearly seven minutes, featuring an instrumental intro that was almost two minutes, a rarity for songs of that era. "Psychedelic soul" soon gave way to "cinematic soul"—highlighting a further series of lengthy recordings featuring detailed orchestration, extended instrumental introductions and bridging passages. Often focusing on lyrics about the ghettos and inner cities of black America, these songs were heavily influenced by the work of singer-songwriters Isaac Hayes and Curtis Mayfield. Unlike Hayes and Mayfield however, the Temptations had no creative control over their recordings, and were in no way fond of the 12- and 13-minute-long songs being forced upon them by Whitfield, whose contributions were the focal point of Temptations albums such as Solid Rock, All Directions, and particularly Masterpiece. In 1974, after Whitfield was dismissed as the producer for the Temptations, the group altered its sound to accommodate a balance of both up-tempo dance material as well as ballads. The vocal arrangements began to again focus primarily on one lead singer per track, although some leads were still being shared periodically. In addition, the Temptations themselves, after fighting Motown and Berry Gordy for creative control, began to write and produce some of their own material. From this point on, the Temptations focused almost exclusively on songs about romance. However, songs about social issues similar to the recordings made during Whitfield's tenure were periodically produced as well. Temptations recordings of the mid 1970s focused significantly on the influences of funk music from artists such as Parliament-Funkadelic and Sly and the Family Stone, and members of both acts contributed significantly to material recorded by the group during this period. Their signature ballad sound, reduced to filler material during much of the Whitfield period, was restored to the lush, full productions of the earlier hits produced by Smokey Robinson. After a brief diversion into disco in the late-1970s, the Temptations settled into a form of an adult contemporary-rooted type of R&B, a style in which they continue to record. Berry Gordy insisted that all his acts be equally appealing to both white as well as black audiences, and employed an extensive creative team to help tailor Motown talent for the crossover success he desired. Motown choreographer Cholly Atkins, along with Paul Williams, created the trademark precise and energetic, yet refined, dance steps used by the Temptations onstage. The most famous of these, the Temptation Walk, or Temptation Strut, was adapted from similar moves by the Flamingos and the Vibrations, from those two sources, Atkins and Williams crafted the resulting signature dance routine. Like other similar independent companies of the period, Motown was not a member of the Recording Industry of America, preferring to stay independent and handling their own widely varied distribution through thousands of "Mom & Pop" record stores and small radio stations. As such, hit singles by Motown artists such as the Temptations never achieved official "gold" or "platinum" RIAA certification until after Motown joined the RIAA in 1977. During the 1960s and 1970s, a number of soul groups showed significant influence from the Temptations, among them the Delfonics, the Chi-Lites, Parliaments, featuring George Clinton, the Dramatics, Daryl Hall & John Oates (from 1965–67, one of Daryl Hall's earliest bands was named the Temptones), and Motown labelmates the Jackson 5 and the Undisputed Truth. These acts and others, showed the influence of the Temptations in both their vocal performances and their onstage choreography. The Temptations' songs have been covered by scores of musicians, from R&B singers such as Luther Vandross ("Since I Lost My Baby"), to pop vocalists such as Bette Midler ("Just My Imagination"), to rock bands such as Rare Earth ("Get Ready"), Anthrax, Love and Rockets, Duran Duran ("Ball of Confusion (That's What the World Is Today)" and the Rolling Stones ("My Girl", "Ain't Too Proud to Beg", "Just My Imagination") and Mick Jagger's collaboration with reggae artist Peter Tosh on ("Don't Look Back"). British rock singer Rod Stewart released a cover of "I'm Losing You" in 1971, and, in 1991, collaborated with the Temptations on the single "The Motown Song". In 2004, Rolling Stone magazine ranked the Temptations number 67 on their list of the 100 Greatest Artists of All Time. The Temptations were voted into the Michigan Rock and Roll Legends Hall of Fame in 2005. They received the Lifetime Achievement Grammy Award in 2013. On Saturday August 17, 2013, the Temptations were officially inducted into the R&B Music Hall of Fame at the inaugural ceremony held at the Waetejen Auditorium on the campus of Cleveland State University. The Temptations on stage at London's Royal Albert Hall, November 2005. Pictured L-R: Joe Herndon, Otis Williams, G.C. Cameron, Terry Weeks, and Ron Tyson. For a detailed listing of the various versions of the Temptations (and a timeline), see: List of the Temptations band members. 1990: performed CBS network's 1990–91 version of their "Get Ready" campaign with an updated version of Get Ready. ^ (2005). "The Temptations Archived 2005-03-20 at the Wayback Machine". Memorabletv.com. Retrieved November 5, 2005. ^ (2003). "The Temptations Archived 2005-03-05 at the Wayback Machine". ClassicMotown.com. Retrieved November 5, 2005. ^ (2005) Ankeny, Jason. "The Temptations". AllMusic. Retrieved November 5, 2005. ^ Ribowsky (2010), p. 197. ^ Williams and Romanowski (1988), pp. 26–30. ^ Ribowsky (2010), p. 232. ^ a b Ribowsky (2010), pp. 93–94. ^ a b Williams and Romanowski (1988), pp. 32–38. ^ Williams and Romanowski (1988), pp. 40. ^ Williams and Romanowski (1988), pp. 30, 40–41. ^ Williams and Romanowski (1988), pp. 9, 32. ^ Williams and Romanowski (1988), pp. 68–70. ^ "The Temptations | Biography & History | AllMusic". AllMusic. Retrieved 2017-09-25. ^ "Elbridge Bryant". Discogs. Retrieved 2017-09-25. ^ Blair, Elizabeth (June 4, 2000). "Weekend Edition: 'My Girl'", NPR.org; retrieved May 17, 2009. ^ a b Ribowsky (2010), pp. 122–124, 174–177. ^ Ribowsky (2010), p. 171. ^ Ribowsky (2010), p. 181. ^ a b c Meros, Tom. "Dennis Edwards (Interview)". ^ a b Ribowsky (2010), pp. 184–187. ^ a b Ribowsky (2010), pp. 187–88. ^ a b Ribowsky (2010), pp. 199–200. ^ a b c d Ribowsky (2010), pp. 165, 212, 217–222. ^ Pierce, Scott D., "Tale of the Temptations", Deseret News, November 1, 1998. ^ Interview with Richard Street, R&B Showcase Magazine Retrieved from  on May 13, 2010. ^ a b c d Ribowsky (2010), pp. 213–216, 219–221. ^ Interview with Eddie Kendricks, Urban Street. Retrieved from  on May 17, 2009. ^ Ribowsky (2010), p. 226. ^ Ribowsky (2010), p. 227. ^ Ribowsky (2010), p. 236. ^ a b Williams and Romanowski (2002), pp. 161–166. ^ Williams and Romanowski (2002), pp. 170–171. ^ Williams and Romanowski (2002), p. 172. ^ Williams and Romanowski (2002), pp. 249, 259. ^ a b Williams and Romanowski (2002), p. 177. ^ Williams and Romanowski (2002), p. 183. ^ Williams and Romanowski (2002), pp. 178–82. ^ a b Williams and Romanowski (2002), pp. 193–197. ^ a b "Ray Davis-The Original P Interview". Vermontreview.tripod.com. Retrieved November 8, 2008. ^ "Ali and Harry together in concert". Thetemptations.com. Archived from the original on July 28, 2011. Retrieved November 2, 2011. ^ "Otis Williams". Otiswilliams.net. Archived from the original on October 17, 2008. Retrieved November 8, 2008. ^ wcao1234. "THEO PEOPLES VISITS LEE MICHAELS & HEAVEN 600". ^ Zurawick, David (October 31, 1998). "'Temptations' is hard to resist Preview: In the history department, this miniseries is a bit shaky. But when the music starts, holes in the plot melt into the background.." The Baltimore Sun. Retrieved February 17, 2013. ^ a b Williams and Romanowski, pp. 236–239. ^ "Two Lawsuits Are Filed Against 'Temptations' Miniseries". Jet. April 5, 1999. Retrieved February 17, 2013. ^ "RUFFIN-STEINBACK v. dePASSE (United States District Court, E.D. Michigan, Southern Division.)" (PDF). February 3, 2000. Retrieved February 17, 2013. ^ "Welcome to Glicker & Associates". Glickerlaw.com. Archived from the original on October 2, 2008. Retrieved November 8, 2008. ^ "Various Photos". The Temptations Photo Gallery. Archived from the original on February 24, 2007. Retrieved February 6, 2007. ^ November 28, 2005. "Temptations Record 15 Classics for Reflections Archived 2006-01-03 at the Wayback Machine". Universal Records press release, Retrieved December 3, 2005. ^ "GC Cameron's WHCR 90.3FM June 8, 2007 Interview with Maurice Watts". Mauricewatts.com. Archived from the original on November 10, 2008. Retrieved November 8, 2008. ^ "Amazon.com: Back to Front: The Temptations: Music". Amazon.com. Retrieved November 8, 2008. ^ "The Temptations Turn to Auto-Tune on New Album". Spinner.com. May 5, 2010. Retrieved November 2, 2011. ^ "The Recording Academy Announces 2013 Special Merit Awards Recipients: ALAN AND MARILYN BERGMAN, CHARLIE HADEN, CAROLE KING, ROYER LABS, RAVI SHANKAR, AND THE TEMPTATIONS AMONG CLASS OF 2013 SPECIAL MERIT AWARDS RECIPIENTS". Grammy.com. February 9, 2013. Retrieved February 27, 2013. ^ "Lifetime Achievement Award for The Temptations at Special Merit Awards Ceremony & Nominees Reception". Grammy.com. February 9, 2013. Retrieved February 27, 2013. ^ Associated Press (February 26, 2013). "Damon Harris, Who Sang With the Temptations, Dies at 62". The New York Times. Retrieved February 27, 2013. ^ McCollum, Brian (February 27, 2013). "Temptations' Richard Street dies". USA Today. Retrieved February 27, 2013. ^ Haffenden, George. "New Line-Up Of The Temptations Revealed". The Funk and Soul Revue. Retrieved January 14, 2016. ^ "Tower of Power - Larry Braggs' bio". Tower of Power. Retrieved January 14, 2016. ^ "Tower Of Power Larry Braggs final performance 12.28.13". YouTube. Retrieved January 14, 2016. ^ Suosalo, Heikki. "Ali Ollie Woodson Interview". Soul Express Online. Retrieved January 14, 2016. ^ "The Temptations". Discogs. Retrieved 12 January 2019. ^ "The Immortals: The First Fifty". Rolling Stone. Retrieved February 5, 2007. ^ "Michigan Rock and Roll Legends - TEMPTATIONS". www.michiganrockandrolllegends.com. Retrieved 12 January 2019. George, Nelson. "Cool as They Wanna Be". The Temptations: Emperors of Soul [CD Box Set]. New York: Motown Record Co., L.P.
Weinger, Harry (1994). "Sunshine on a Cloudy Day". The Temptations: Emperors of Soul [CD Box Set]. New York: Motown Record Co., L.P.
Williams, Otis and Romanowski, Patricia (1988, updated 2002). Temptations. Lanham, MD: Cooper Square. ISBN 0-8154-1218-5. George, Nelson (1985, rev. 2003). Where Did Our Love Go: The Rise and Fall of the Motown. London: Omnibus Press. ISBN 0-7119-9511-7. Ribowsky, Mark (2010). Ain't Too Proud to Beg: The Troubled Lives and Enduring Soul of the Temptations. Hoboken, New Jersey: John Wiley & Sons.ISBN 978-0-470-26117-0. Wikimedia Commons has media related to The Temptations. "The Temptations". Rock and Roll Hall of Fame.